Travel Oregon has a cool new program and it went live this week! 13 Ask Oregon travel ambassadors answer your questions about this awesome state live through various social media. You guessed it – I’m one of them. You could say Oregon is a refuge for dreamers: a place where it’s still possible to grow the best hazelnut, hike to an isolated, breath taking vista, or explore a unique display of artistic expression. To help you have an authentic experience, our Ask Oregon ambassadors are ready to share their expertise on cycling, hiking, dining, and traveling across our beautiful state. Have a question? Ask Oregon! On Twitter, use the hashtag #AskOR or click the icon. 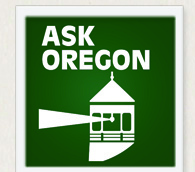 On Facebook, ask on Travel Oregon’s wall or click the icon. I’m really excited to participate alongside some cool travel Oregon experts….come on by and Ask Oregon.